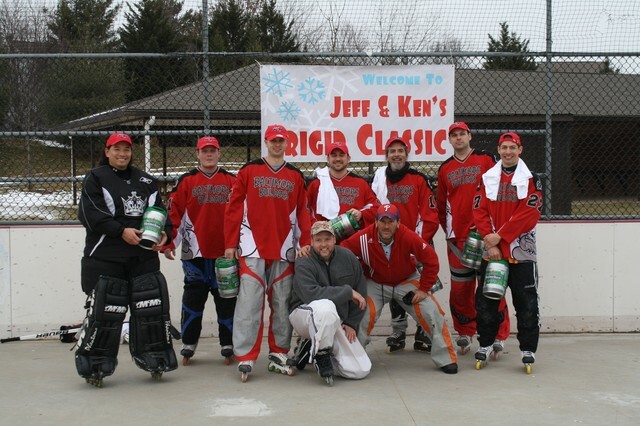 The first ever Frigid Classic rollerhockey event, hosted by Jeff Bales & Ken Cheney, was held at the outdoor roller rink in Fredericktowne Village Park in Frederick MD. 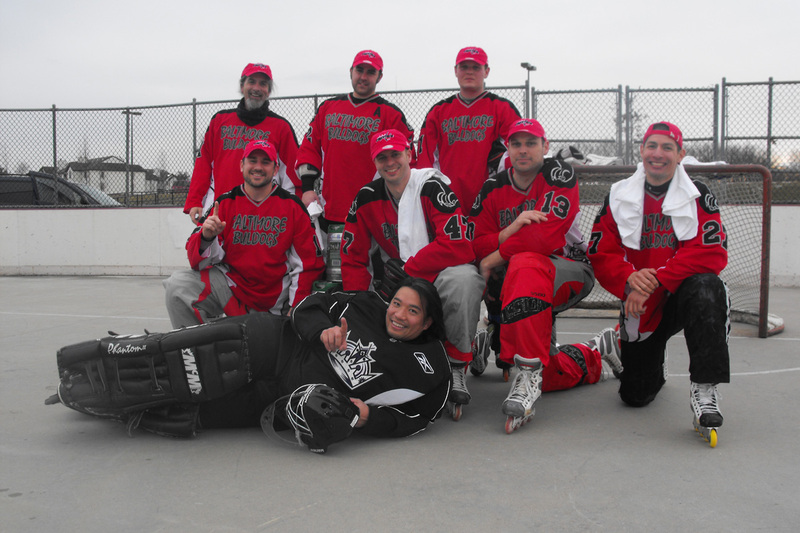 The event was the brainchild of Jeff and Ken, who during a late 2009 phone call discussed getting the rollerhockey crew from the mid-1990's back together. 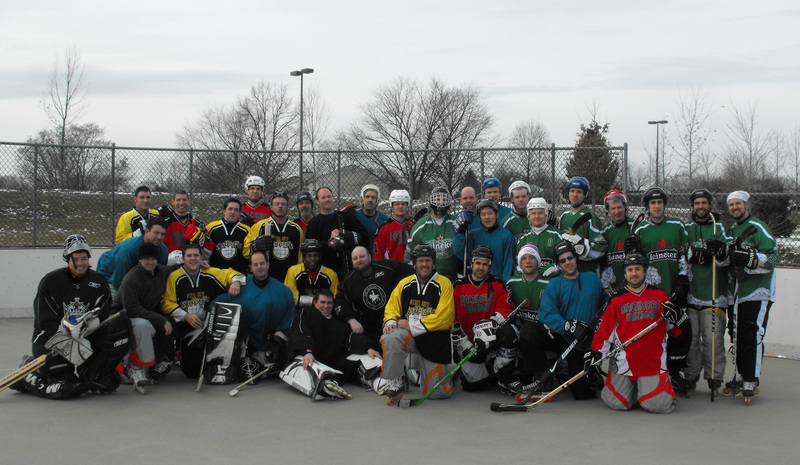 Even though only a handful of the old school guys were on hand it was still an awesome day of hockey. A snowstorm on the previous Tuesday threatened to force a postponement, but diligent shovel-work by Jeff Bales, Dave Young, John Rokos, Ken Cheney, and the snow blower guy saw that the rink was cleared by Friday evening. Four teams were on hand to vie for the Frigid Classic title, including the Marauders captained by Ed "Gator" DeGeyter, the Bulldogs led by John Rokos, the Snipers helmed by Sep Fraunhoffer, and Team V skippered by Dan Voronkov. The temperature reached a high of close to 40 degrees early in the morning, but by the end of the event had dropped down to a blustery 33 degrees. It certainly got a bit frigid! The preliminary round opened at 9:00am with the Bulldogs defeating the Snipers by a score of 4-1. The Bulldog were led by captain John Rokos with three goals, defenseman Ryan Callahan chipped in four assists, and goaltender Jiro Wada was steady in net. The next game was a low-scoring thriller - with excellent goaltending - between Team V and the Marauders. Team V's leading scorer Mike Dobbins scored on a breakaway against Marauders' netminder Jason Worley with just over two minutes remaining for the only tally of the game. Goaltender Steve Harris of Team V had the only shutout of the day. In the third game the Bulldogs, led by Rokos' four goals, road a 5-0 halftime lead to a 7-1 whitewashing of Team V. The Marauders then got their offense in high gear with an 8-2 drubbing of the Snipers. Chris Able of the Marauders scored four goals and added an assist. The Snipers were right back in action in game five, this time defeating Team V by a score of 7-3. Anwar Gorham of the Snipers led the way with four goals, at least two coming on breakaways. The final game, featuring a first place battle between the Marauders and Bulldogs, was one of the best of the day! The Marauders took a 3-0 lead late into the game before the Bulldogs erupted for a trio of goals in a span of just over three minutes. Drake Deming broke free on a long breakaway to score with 1:13 remaining and the Marauders survived a furious extra man attack to win 4-3. The first semi-final playoff matchup featured #1 Marauders taking on # 4 Team V. The boys from Team V, led by the outstanding goaltending of Steve Harris, played a tight defensive game and took a 3-1 lead into the half. The Marauders could not seem to mount much of a sustained second half attack and eventually fell 4-2. Dan Voronkov and Mike Dobbins led Team V with two goals a piece. With their second defeat of the Marauders the surprising V-boys advanced to the championship game. The other semi-final was an entertaining contest between the #2 Bulldogs and #3 Snipers. The Bulldogs took a 4-1 halftime lead, but the Snipers fought back to tie it up at 4-4. The Bulldogs' attack added quick two goals, but the Snipers scored with the extra man at 0:59 to make in interesting. The Bulldogs ended the threat with an empty net goal by Mike Staub at 0:17. Final score 7-5. After a short break the Bulldogs took the rink again to face the upstart challenger of Team V. The Bulldogs offensive prowess was in full effect and they took a commanding 5-0 lead into the half. The Bulldogs, led by John Rokos' three goals, sat on their lead and coasted to a 5-1 victory. Congrats to the Bulldogs - John Rokos, Ryan Callahan, Jiro Wada, Mike Staub, Roger Marks, Tom Leal, Marty Fitzpatrick, and Greg Dengler - the first ever Frigid Classic Champions!